Alex: Looks to me like Black has a number of good options. I would probably instinctively play immediately, but since you say it's a tesuji problem, something more clever is probably in order. 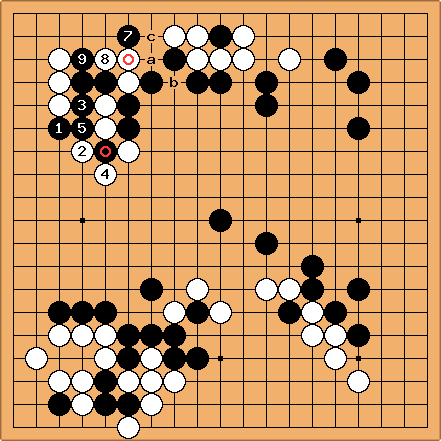 looks like a shape point to me, and White doesn't seem to have anything better than this sequence, which helps Black enclose a lot of territory in the left-centre. After , the safe move is a, and Black's lead is enough that safe moves are probably the best plan. tderz: Cutting point a is indeed a problem to be resolved in gote. This sequence is not correct. "instinctively play immediately" ... amazing! Many people would descend to . Could you elaborate further on ? ilan: My instinct says to play here. Alex: Well, the original reason I said here would be instinctive to me is that it threatens ladders at both a and . 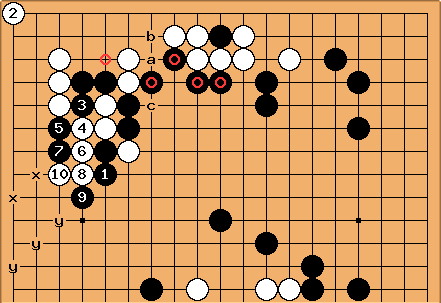 However, when W responds at , if Black plays at immediately, White at would be sente, so this isn't acceptable. I still don't think is bad, though, because after Black blocks at , even if White exchanges for , she'll have trouble pulling out her cutting stones and they won't have much value, since Black is strong enough on both sides. 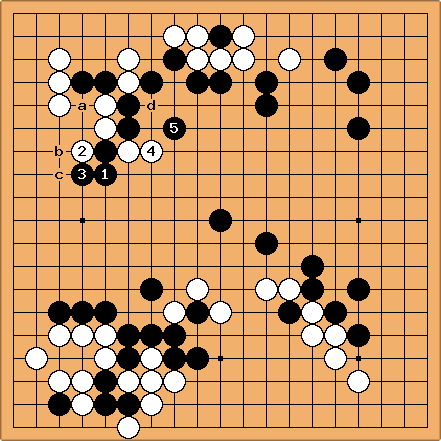 Meanwhile, Black will probably get to force at b or c, which is rather painful for White. tderz: Alex, you correctly conclude, deduce that here is not the proper shape. The later is aji keshi for the cutting points. I could write it here, but simply suspect that you are still online. Alex: If White plays the table point at , Black can attach at and crosscut with . There are many variations after this, but most of them seem to start a fight that is unreasonable for White because of Black's thickness on the left, so White does not seem to have anything much better than , which lets Black make a lot of territory, albeit in gote. I don't think there's any need to capture White's marked stone at the moment. White's result would be slightly better in endgame terms if she played atari at before capturing with . 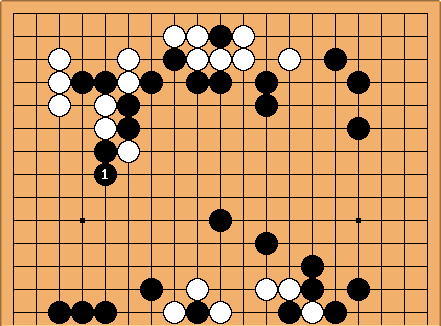 However, then Black would have the option of starting a large ko by resisting with a. I haven't taken the time to count threats, so I don't know whether it's worth the risk for White. is aji keshi, finding something better is the solution. 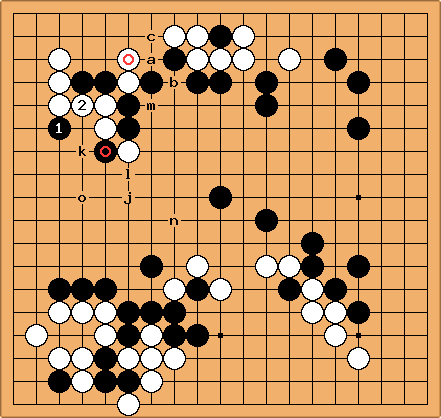 I think there is a great need for controlling cutting points in the only moyo vs. a 7-dan ("capturing White's marked stone" = honte). Alex: My thinking behind instead of b is that b will still be sente later, since the follow-up is about 10 points sente, so maybe it's best to keep it around as a ko threat. However, that was assuming that Black would take gote and connect at . If the plan is to tenuki, I guess you probably need b first, or else whatever tesuji you have in mind for the next problem may not work. tderz: basically Black gets without ko. This is big. Of course, it's better to exchange first -c-d-e before that (ko). zinger: At a glance, I considered the obvious move, and indeed I'm still not finding much better. Here is one other possibity I thought of, but I have my doubts about it - white is more likely to play at a, at b, then c, and black doesn't seem to have accomplished much. I'm looking forward to the solution. - "Connect your own stones"
If at k, white could create a triple miai (o, m or around n) with l or j. Bill: is a kind of tesuji, but is it aji keshi? After White can respond with to . The side is larger than the four stones, no? Although after - it's a difficult fight. tderz: I agree Bill. 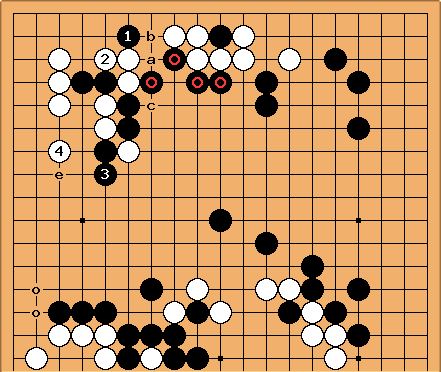 Black needs 2 moves a+b (tempo) to connect to the rest, this while already 1 white move a would be sente (of course this would be aji-keshi too). White f+g form very bad geta-aji against Black here (if he wanted to resist too much). tderz: a white stone on severely erase this ladder aji here. 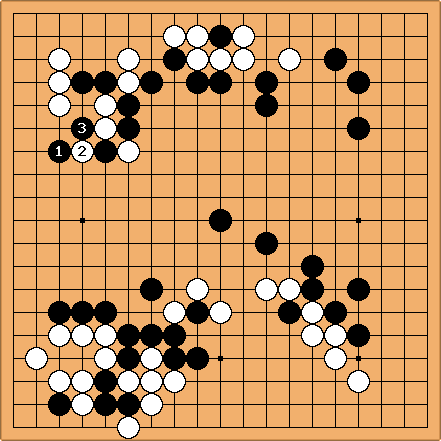 tderz: Despite that the ladder aji is gone after , White will still play this here (safe). White does not need to extend to e (unsafe), because Black has a (double) open skirt ( +o). how to continue after ? During the game I thought that the variation  (with a little difference, cf. /solution is the solution. Now I am not so sure anymore. 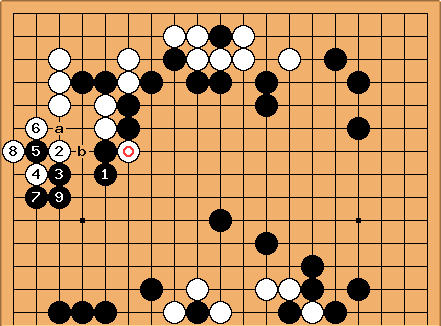 Because  is so bad for white, she cannot allow it and will play , which ends in gote and therefore has lots more aji than , but is slightly bigger. 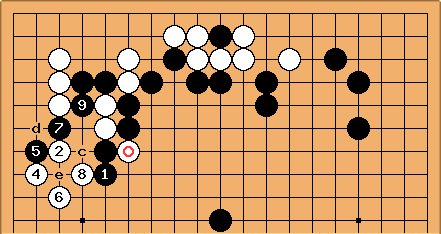 If one was 90% sure ("pretty sure") to handle the aji and knew the score (I knew neither :-( ), then one could play .